0830 and we’re at the Navy Yard. A cluster of hard hats awaits us. The dock is flooded and the caisson (door) is open. A dinky block of wood floating on a slim line across the head of the dock indicates the centerpoint to align with the Whalen’s bow. The opening is too narrow for the tug to keep us on the hip, so the tug lands us on a fuel barge just outside the caisson, and moves to our stern to push us in. The Delaware’s tankerman helps out with lines even though he’s still in his slippers and it looks like we woke him. We slide in and the gantry crane soon swings over a man basket and lifts the guests away. My adrenaline wicks away rapidly. I’m beat. Wednesday night was a sleepless one due to the cold. 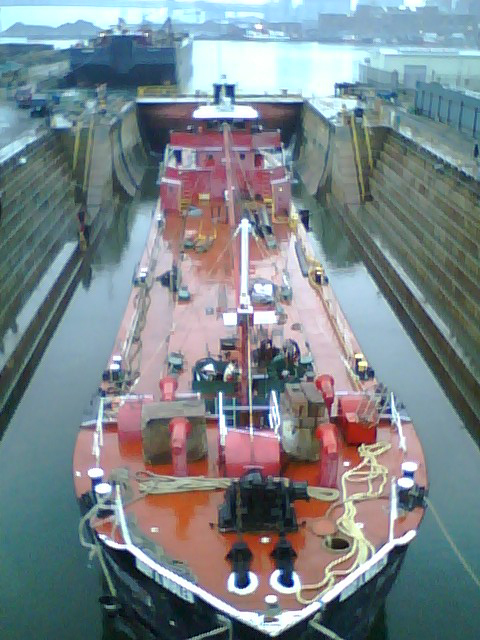 You can also check out some cool photos of the ship in drydock at Stefan Falke's Eye and over at Tugster. We had to miss the trip to the Navy Yard, but we're hoping to be able to visit or to make the trip back. (We visited the Mary Whalen during Open House New York and you can check out the photos in our GL post with a flickr slideshow or just go over to the flickr set.) What we really can't wait for, however, is for the Mary Whalen to start her new life berthed in Red Hook, welcoming visitors. Monteleone's About to Reopen on Court Street!